Starting an herb garden has been on my mind for years.. But I was going to school, then we had children... so it wasn't until 2 years ago when I finally found couple spots and started planning. By now, I am glad I did and I am here to share with you some pictures as well as small advice about starting your own! 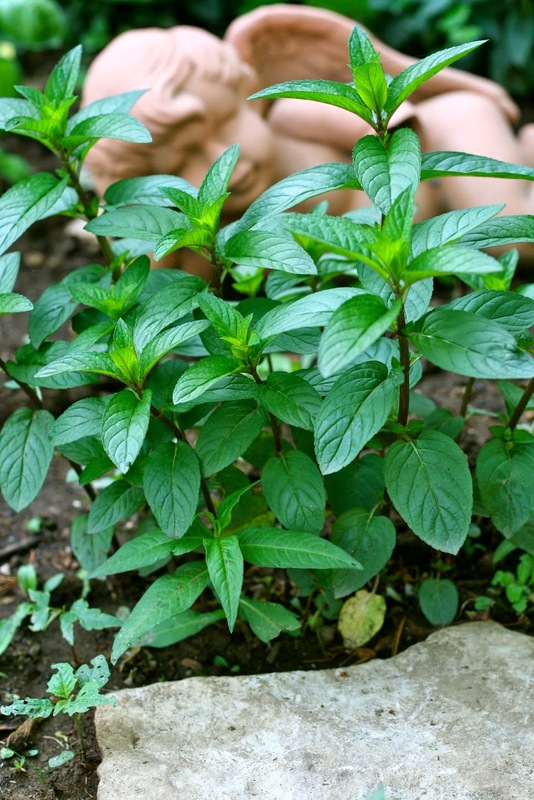 My first herb plant came from my husband's grandma and it was peppermint. I started with a tinny bunch that you see above and look what 2 years did to it ;-) This brings me to the first important point for starting your herb garden - Plan out your space carefully! Read the labels on your plants or ask the person who is giving it to you - how large does the plant get? Plants in the mint family can spread really wide. I suggest you maintain them in the Fall and Spring. I love to share mine with friends or dry them for the winter months. I love fresh oregano in my potato dishes! Here is a small bunch in my garden - Oregano doesn't spread fast but it becomes very bushy. I found that one plant was enough for our family to use as a fresh ingredient during the summer and also have plenty to dry for the winter! Who doesn't love thyme in a chicken dish? Thyme has tiny leaves and doesn't become very large. I like it right on the front edge of my herb garden! I will be adding few more plants this year. 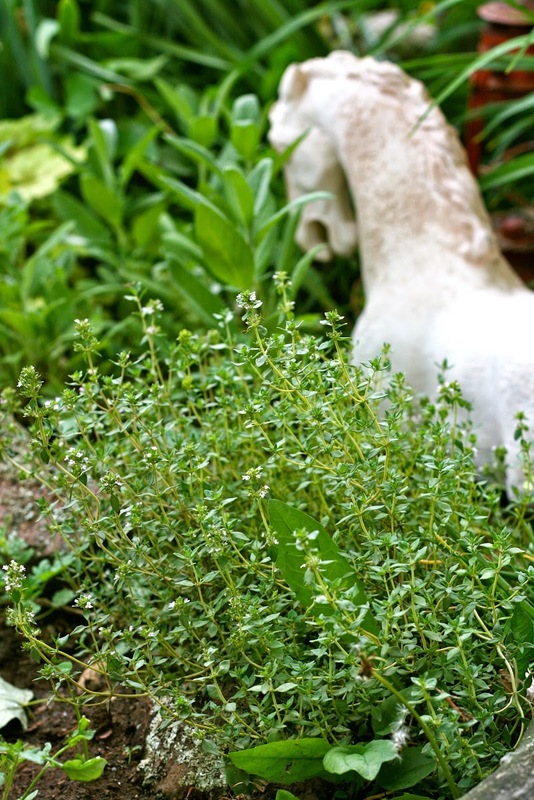 Did you know that thyme is great herb to use when you have cough? We love making tea or just simply dipping fresh stem into our water bottle! 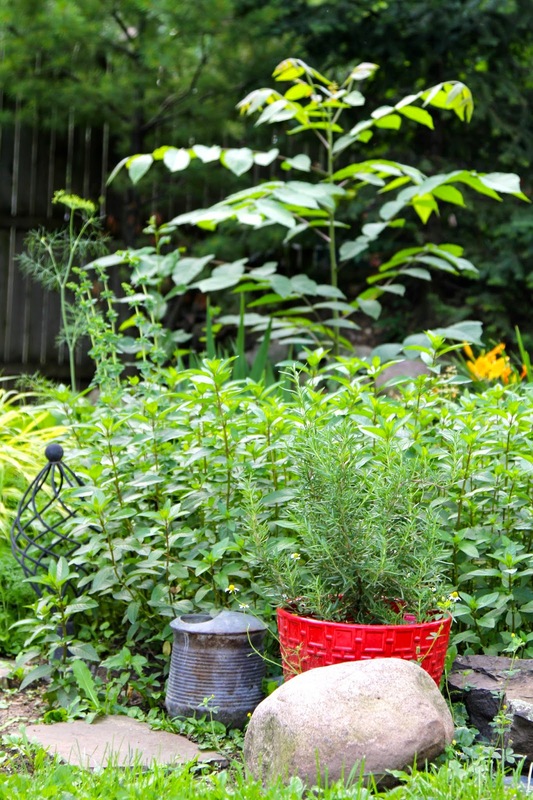 Don't just assume that you need ground space for your herbs! I am sure you heard about potted herb garden... If you live in a palace that only has a porch, a patio, or a balcony, this would be a perfect fit for you! Even though I have a backyard, I still like to break up the space using potted herbs. Like in this picture, I use bright red color pot for all green background. The herb that needs to be in the pot if you want to enjoy it yearly is rosemary. It doesn't like tough midwestern winters so I take it inside for the cold months. But right now it plays a great role in my herb garden bed by the pond. Originally I also placed a mint plant into the pot because I knew it was going to spread widely and I had no space for it. I will be replanting it this year into my side garden herb bed. Take a look at my side house herb garden... As you might notice, my intention here is not only to have useful plants in my yard but also to have a pleasant and unexpected eye catcher ;-) Which brings me to the next advice - Choose your plants carefully. You want to plant herbs that you enjoy using in your dishes or your drinks and you want to combine them so they all compliment each other esthetically. Look out for height, width, and color of your plant. I also like to combine different sizes and shapes of leaves. And why not add a regular plant into your mix, such as decorative grass or a rock to break up the space. One year after you plant your herbs, you might realize that you positioned them wrong and the taller one is in front of the shorter one - no worries, just replant... this is all a case of trial and error and by the second year, all will be good. And finally choose the right location based on how much sun light your plants require. 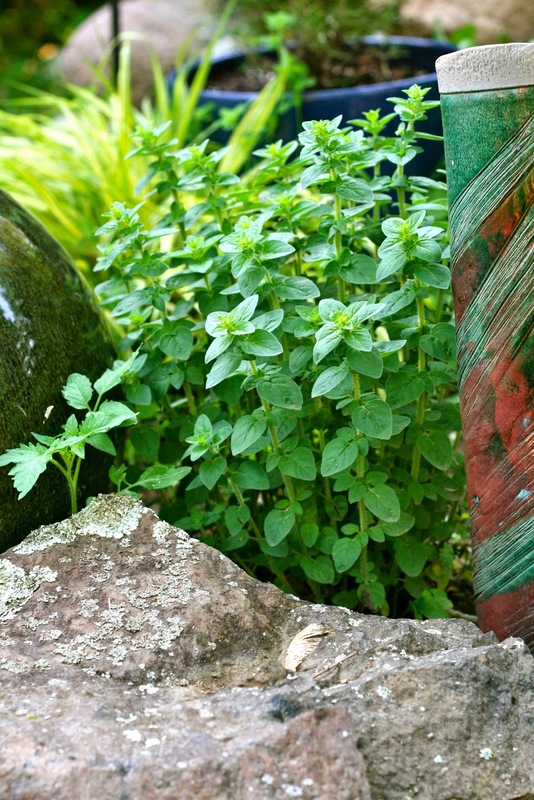 Most herbs love sun, so make sure they receive at least 5-6 hours of sun light per day. 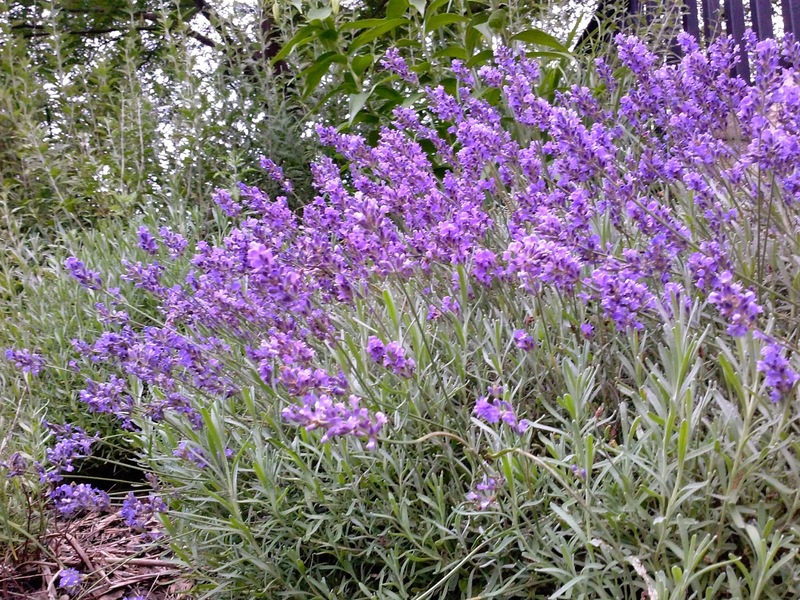 Those that love full sun exposure are: lavender, oregano, thyme, basil, and rosemary (also known as the Mediterranean Herbs) Parsley, lemon balm, and mint plants will be happy in shade. 2. Fresh herbs are always at hand - and they are priceless for any dish you are creating. 3. It looks beautiful - people love herbs! And people love look at nicely grown bunch of plants! 4. It smells beautiful - When you pass by it truly smells wonderful! 5. You save money - Have you seen the prices of fresh herbs in the grocery store? How about dry spices? That is my point exactly! 6. You get to share it with friends - Last but not least, you get to share your green treasures with your friends!